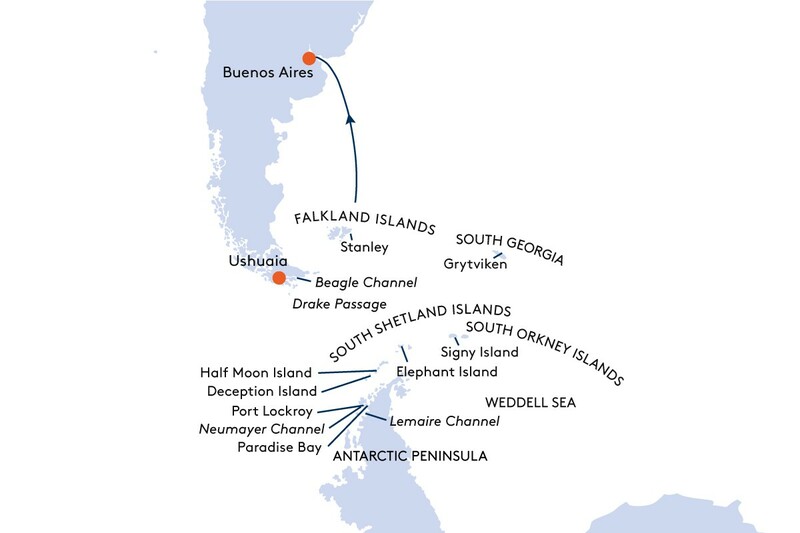 Expedition Antarctic - An explorers' adventure amidst the ice. Please note: your voyage rates include Charter flight as per itinerary in Economy Class. South Shetland Islands Although the South Shetland Islands are largely glaciated, their climate is mild in Antarctic terms. Board a Zodiac and set out for Half Moon Island, where vast fields of snow contrast starkly with the dark rock depending on the season. The volcanic legacy of the archipelago becomes particularly intense on Deception Island: board your expedition ship and the Zodiacs and head deep into the caldera whose collapsed volcanic cone forms the island. Hot underground springs cover the beach in mystical steam at the right the water level. Antarctic Peninsula Setting foot on the Antarctic mainland is an unforgettable experience. Tranquil and endless, the shimmering masses of ice stretch out before you and take your breath away. Get up-close to penguin colonies, the fascinating water ballet of the icebergs and mighty mountain ranges that guard the coast – the endless ice of the Antarctic Peninsula will make a profound impression on your heart and soul. Fur seals, elephant seals and gigantic colonies of king penguins – South Georgia’s animal kingdom is one of our planet’s greatest wonders. The king penguins raise their young in the subantarctic summer and autumn – fluffy brown chicks crowding the shores like a huge kindergarten. Take a look behind the scenes of this unique animal paradise on walks, hikes and Zodiac rides. Geographically, the Falkland Islands are part of Argentina, but politically they belong to the United Kingdom. British influences are evident throughout Stanley, the capital. The most striking example is the impressive Christ Church Cathedral, which adorns its centre. The Falkland Museum provides deep insights into Stanley’s past. The Hanseatic is an attractive cruise ship for the explorer type of tourist. Moreover, it offers a five star standard to its guests. During the day the dress code on board is casually sporty and ashore mainly comfortable and appropriate to the destination visited. Only for the occasion of the Captain's dinner a formal dress code would be recommended. Most of the guests belong to the middle to advanced age-groups. The Hanseatic is less attractive to families. • Special encounters await you in the endless ice – for example, on the South Shetland Islands and the Antarctic Peninsula, where colonies of gentoo penguins await your visit. • Again and again, the Zodiacs will take you to hidden places with spectacular panoramas and surprising wildlife sightings. • One of the most impressive sights of your expedition comes as the partially glaciated peak of South Georgia rises from the waters. • The crowning glory is Stanley, the small capital of the Falklands with its British charm. Enjoy Brazil - the rhythm of the tropics in the footsteps of explorers....click here to read more. Expedition Caribbean - a group of enchanting islands....click here to read more. Expedition Northwest Greenland - thrilling polar adventure. Please note: your voyage rates include Charter flights as per itinerary in Economy Class....click here to read more.